After leaving SeaWorld, Hargrove became one of the stars of the controversial documentary Blackfish. The outcry over the treatment of SeaWorld’s orca has now expanded beyond the outlines sketched by the award-winning documentary, with Hargrove contributing his expertise to an advocacy movement that is convincing both federal and state governments to act. 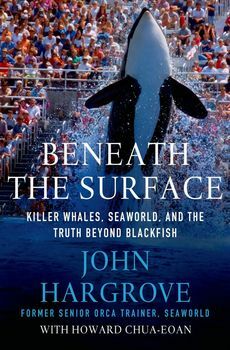 In Beneath the Surface, Hargrove paints a compelling portrait of these highly intelligent and social creatures, including his favourite whales Takara and her mother Kasatka, two of the most dominant orcas in SeaWorld. And he includes vibrant descriptions of the lives of orcas in the wild, contrasting their freedom in the ocean with their lives in SeaWorld. Hargrove’s journey is one that humanity has just begun to take—toward the realization that the relationship between the human and animal worlds must be radically rethought.